Glade Zone: The Crescent Ridge Glade in the 10,000 acre Randolph Community Forest is approximately 75 total acres situated in a southeasterly to easterly aspect. The glade is designed to appeal to all abilities and provides stunning views of the northern Presidential Range of the White Mountains. There are five glade lines in the upper pitch of the zone, all of which vary in design but generally contain a slope angle in the range of 30-35 degrees for approximately 300 vertical feet. 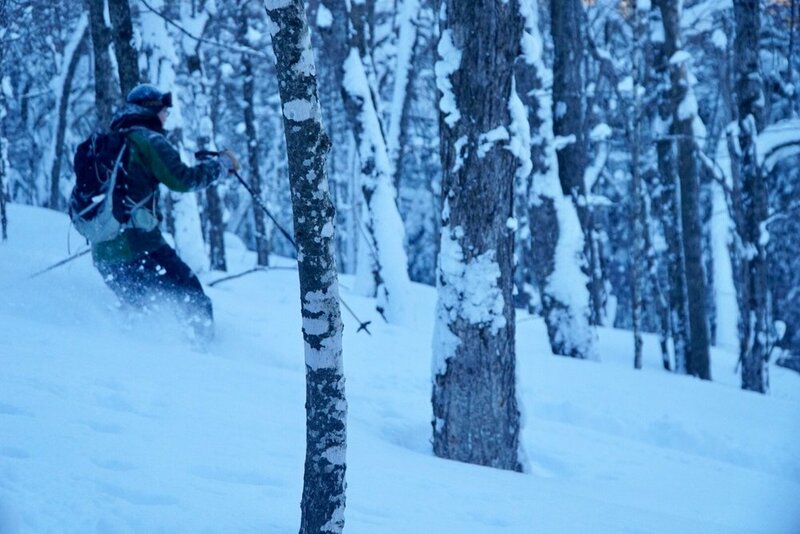 Each glade line deposits the skier into a large open hardwood glade. This middle section is approximately 20-25 degrees and extends an additional 300 vertical feet. The lower section contains a tree-less wildlife area at 10-15 degrees and it is here one becomes distracted by the delightful views of the northern Presidentials. The skier can either ski through the wildlife area back over the nordic trails to the point of beginning or have the option to continue down a blue-blaze marked ski route to the Community Forest Road (formerly Jimtown Logging Road) and return to the parking lot. (See documents linked below for additional information). Description of Crescent Ridge Glade. 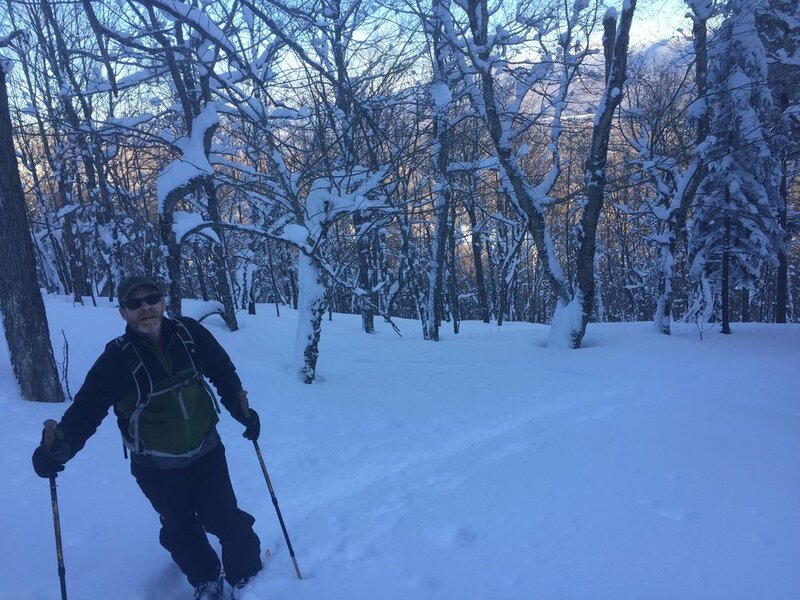 From atop Crescent Ridge, GBA has cut five “skiable lines” (which can be understood as ski corridors) that guide the skier through the trees exiting into the “fan”, which is the wide naturally gladed middle section of the Crescent Ridge Trail. Ski corridors are not trails in the traditional sense but rather low density vertical lines that are approximately 35-50 feet in width. The walls of the corridors follow the braided design method which places emphasis on patches (or islands) of vegetation within the glade to promote future regeneration to increase the stands’ resiliency and protection from wind throw. Parking: The parking lot is at the end of Randolph Hill Road and is sufficient to hold a maximum of 12 cars. Anything cars in excess of the allotted amount are subject to Town of Randolph winter parking rules. The lot currently is and will continue to be plowed all winter. to get to the Crescent Ridge Glade zone! Access. Access to the glade begins at the kiosk in the Randolph Hill parking lot. (*Do not start below the parking lot at Crescent Ridge Trail sign - drive past this trailhead). Stand in front of kiosk and identify the orange plastic diamond blaze generally to your right (pictured above). This will be the trail marking you need to follow through several critical trail junctions to get to the glade zone. (*Tip: Do not randomly follow skintracks either - this is a heavy touring area with many nordic skiers exploring RCF - don't get lured into the wrong track.) After a mile, the orange diamond blazes which will lead you OFF the Crescent Ridge Trail and onto a dedicated skintrack directly to and through the wildlife management area (*Note: this is common point of error in which users stay on trail missing the left which is also marked by Blue Blazes. Once you are on target, you can follow this to ridge line - and go left and you will encounter the zone but the other way is preferable). Once at top of the clearing you now stand at the bottom of the glade zone. The diamond blazes now become orange flaggings. Follow orange flaggings to the top at which point you may pick your line! There are 4 glade lines, the first containing two glade lines. Choose your own adventure! Each lap thereafter is about a 20 minute skin back to the ridge. Repeat. Enjoy! Status. Complete. In the summer of 2017, GBA and 75 Quarry Dogs cut the Crescent Ridge Glade as approved by the Randolph Forestry Commission. 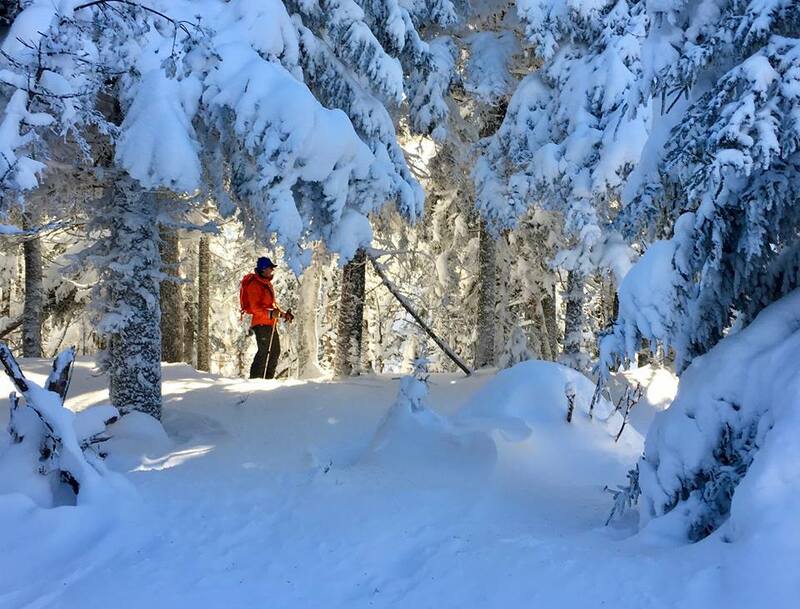 GBA is the RCF's exclusive "Activity Manager" for backcountry skiing in the community forest. Future Glade Expansion. 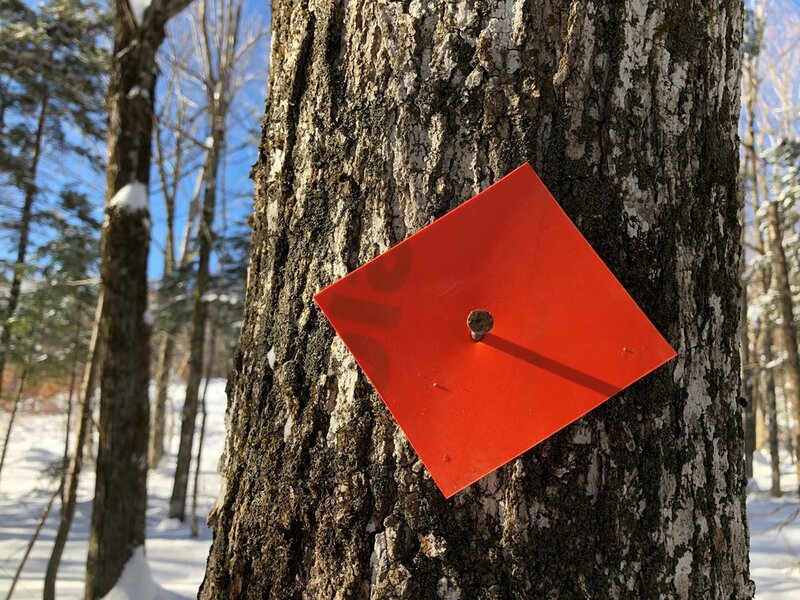 The Randolph Forestry Commission may be amenable to future expansion projects in the Randolph Community Forest provided that the initial pilot project (Crescent Ridge Glade) is successful in that it meets the satisfaction of the Forestry Commission. Satisfaction is generally guided by the implementation and guidance of the project by GBA, the conduct of the volunteers (during implementation) and skiers/riders (during winter months), the review by the Town Forester, adherence to the Activity Manager MOU, environmental monitoring, any other miscellaneous matters that may arise from time to time.